Product prices and availability are accurate as of 2018-07-22 14:07:59 GMT and are subject to change. Any price and availability information displayed on http://www.amazon.com/ at the time of purchase will apply to the purchase of this product. 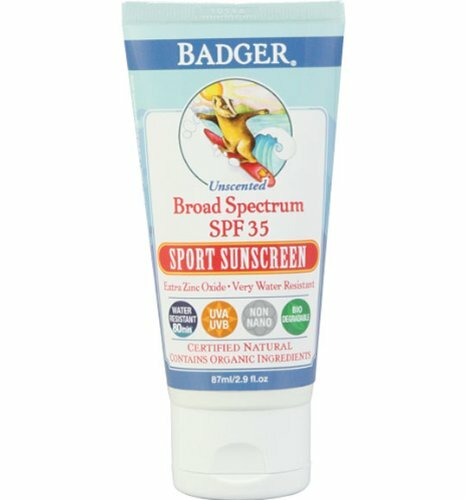 Badger's Broad Spectrum SPF 35 Unscented Sun block provides the best possible security for all your outdoor adventures! It's a cream based, water resistant sun block that will protect you from both UVA and UVB rays, sun, wind, cold, and water in addition to nourish your skin. The base of certified natural oils and butters makes it more resistant to freezing, while producing a protective barrier on your skin and it stays put. It contains extra zinc and is certified with brand-new FDA sun block standards. This extremely water resistant, quick working formula maintains its SPF after 80 minutes of swimming and sweating. 2.9 fl oz. Active ACTIVE INGREDIENTS: non-nano, uncoated zinc oxide (22.5%). Other ACTIVE INGREDIENTS: natural olea europaea (extra virgin olive) oil, natural cera alba (beeswax), natural theobroma cacao (cocoa) butter, natural butyrospermum parkii (shea) butter, and natural simmondsia chinensis (jojoba) oil.Protects skin from wind burn and chapping.Stays put, will not leak or and sting eyes.Environmentally friendly, no animal testing.Very water resistant.Compliant with brand-new sun block guidelines.BPA and Phthalate-free packaging made from 50% recycled material.No included scent.Great for both men and women.Size: 2.9 fl oz. (85.75 ml). SPF 35. Non scented.Protects from UVA and UVB.Retains its SPF after 80 minutes of swimming and sweating.